The genre of musicals in the 21st century is getting a flattering facelift. Hamilton, for example, with its tantalizing alchemy of stimulating passion for history through ingeniously accessible rap and hip hop stands out for how racial barriers in the making of art and culture can be dismantled. Fun Home, staged as theater in the round, instinctively brings audiences closer to the main protagonist’s story, represented at three different phases of her life. 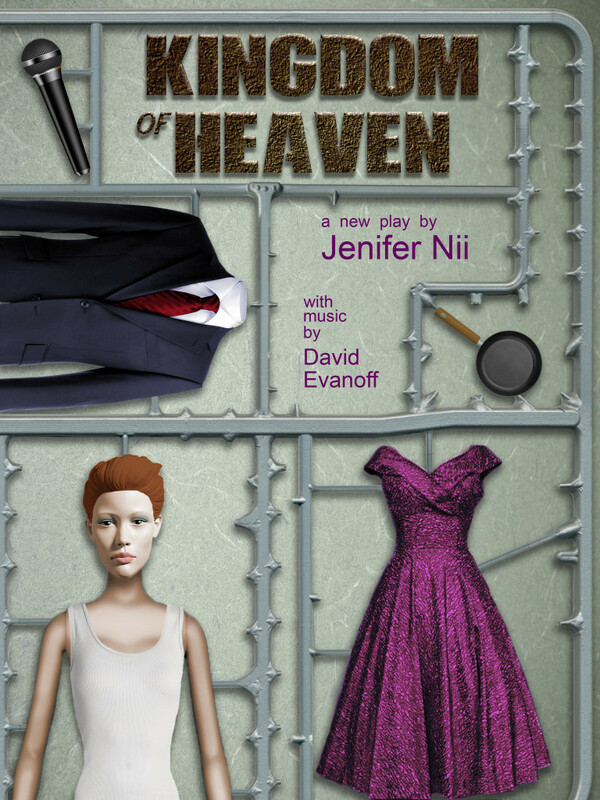 It is appropriate then for Plan-B Theatre to close out its impressive, imaginative 25th anniversary season with its first original musical, Kingdom of Heaven (March 31-April 10), with book by Jenifer Nii, who also co-wrote the lyrics with Dave Evanoff, music director. Plan-B has staged other musicals, including two productions each of Hedwig and The Angry Inch and Gutenberg! The Musical!, all of which were solid successes. And, original song material was featured in Tobin Atkinson’s The Alienation Effekt. Having proven itself consistently as a master of minimalist theater especially in socially conscious original work, Plan-B apparently has landed upon the right opportunity to stage a new musical with the wisest uses of its resources and expertise. Nii, who is still a relative newcomer as a playwright, has written compelling artistic successes for the Plan-B stage, including Suffrage, a play about 19th century Mormon women who briefly enjoyed the right of enfranchisement, and a searing, unforgettable adaptation of The Scarlet Letter. Both plays were nominated for the American Theatre Critics Association/ Steinberg Award for the Best New American Play Produced Outside New York. In Kingdom of Heaven, Nii casts her main character as a dutiful, faithful Mormon housewife who discovers a new part of her identity and cautiously steps into the world of drag to share her new voice. Evanoff is a perfect fit as Nii’s collaborator. 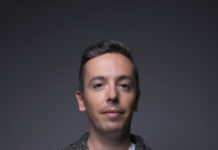 Serving as music director for both of Plan-B’s Hedwig productions, Evanoff also has scored sound and music for six of the company’s 10 Radio Hour series productions. And, in working with director Jerry Rapier, Evanoff makes full use of the laptop as a versatile music instrument which allows the music to be remixed live as actors perform the musical’s eight songs. The impetus for Nii to write a musical was impulsive, the result of a casual Facebook post she wrote after watching a series about drag queens. However, the playwright decided to frame her story around drag kings, something that even the actors cast for the new show had not heard of previously. In fact, even in the long-established world of drag queen performers, the idea of drag kings was nearly as unfamiliar. Miz Cracker, a drag queen from Harlem, wrote a perceptive piece for Slate last year after encountering the single drag king performer in a New York City competition. [The] more I learned about the craft of king drag, the more I came to see it as a perfect companion to the world of queens—a creative, irreverent group of performers dedicated to exploring and parodying notions of gender through art. Like queens, kings create elaborately costumed, choreographed performance spectacles. They labor to master makeup skills, exchanging trade secrets from king to king or through YouTube tutorials. Like queens, they blend their own feelings about gender with the representations of gender in popular culture. Like queens, their reasons for falling in love with drag range from the quotidian to the profound—some come to the art by accident, some for the love of performance, some through a life-long yearning to explore their gender identity. There’s so much we could learn from each other. 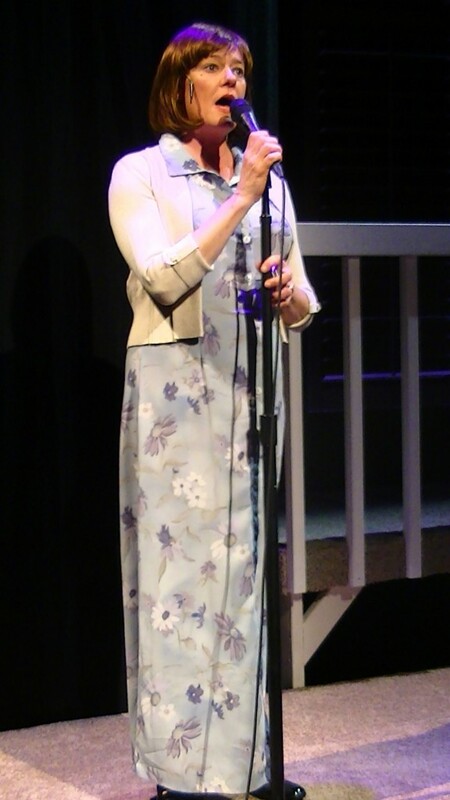 Jeanette Puhich as Mary Jane. Photo: Rick Pollock. Instinctively, the work of Nii and Evanoff underscores these sentiments. Kingdom of Heaven does not challenge Mormonism as much as it does a person’s “life-long yearning to explore their gender identity” and the desire to continue the love and acceptance from loved ones, as Mary Jane wants from her husband Joe; her friend Brenda, and even her faith, despite the fact that her bishop had “disfellowshipped” her from the religion. As Nii explains in an interview with The Utah Review, “I wanted not to demonize or belittle any of the characters but to use the power of the theater and the idea of a musical to sit together and to spark some kind of question about learning to love even more so when we are challenged by new discoveries in our lives.” Kingdom of Heaven follows consistently the critical yet eminently fair tradition of those Plan-B plays that offer a critical eye to how faithful members seek to remain in their religion or to sustain their Mormon identity in their lives during personal crises or life-changing epiphanies. He has scored most of the songs – using his array of Apple instruments (iPhone, iPad, and laptop) – that have a pop rock feel from the 1980s. Evanoff brings the laptop as a dynamic musical experience directly out of the artist’s studio and into the performing venue. 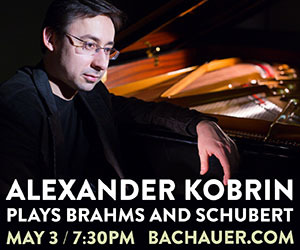 He infuses the artistic objective of improvisation into the mix during the actual performance, which makes the songs feel as being truly of the moment in the story. Thus, the lyrics and their meaning come through clearly, making it very easy for the audience – especially in the intimate settings of the company’s resident Studio Theatre in the Rose Wagner Center for Performing Arts – to follow along. At one point in the dialogue, Mary Jane says, “Not sure if it was a full throttle, crazy 80s, alternative lifestyle kind of day, but I’ve gotta say I have a whole new appreciation for the notion that “people can change.” Not only is that line significant for the musical’s narrative but it also suggests beautifully the ingenious resourceful of the creative team behind the musical. The story line undoubtedly takes up the serious, tension-fraught questions of well-intentioned people scrambling about in their feelings to comprehend sincerely the fact that people can be fluid in the ways they express their gender identity and see it as just another normal and healthy way of dealing with life. And, the songs do not trivialize the debate or issues. 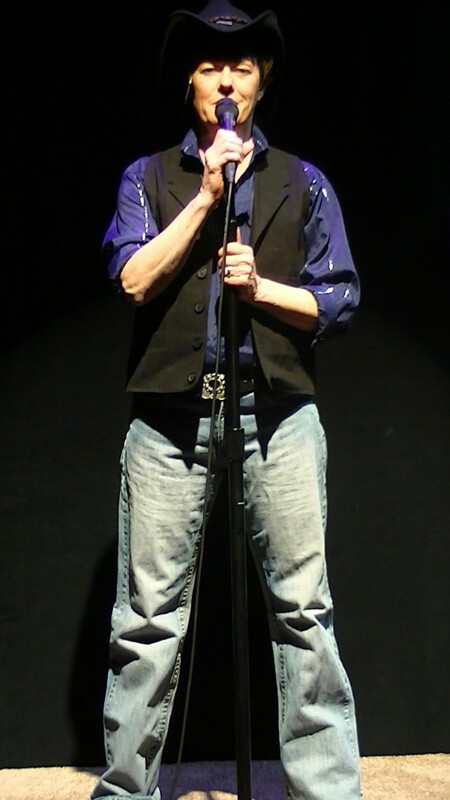 The songs place the issue on its broader cultural terms because the ideal of gender identity appears to be an equal opportunity source of confusion in our contemporary society – regardless of whether one is conservative or liberal, religious or not, gay, bisexual, straight, transgender, single or married, young or old. Jeanette Puhich, Kingdom of Heaven. Photo: Rick Pollock. Nii frames the play wisely about loved ones creating genuinely welcoming spaces for their loved ones and that it’s worth exploring how any division can be healed. In the genre of a musical, the songs keep the intensity of the best alive, ensuring that the process of transformation is not just for Mary Jane but for the others around her. The cast for the production includes Jeanette Puhich (who performed in Plan-B’s first production of Hedwig), David Hanson and Susanna Florence. Rounding out the creative team are Thomas George (set design), Phillip R. Lowe (costumes), Jesse Portillo (lighting) and Jennifer Freed (stage manager). Less than 50 tickets remain for the production, with shows Thursdays, Fridays and Saturdays at 8 p.m., Saturdays at 4 p.m., and Sundays at 2 p.m.
For information about tickets and the production, see here.